Four former Guantanamo Bay prisoners protested on Friday night in front of the US Embassy in Montevideo, Uruguay, complaining over “broken promises” and demanding greater financial support from Washington. The men are part of a group of six detainees who were released from the US military prison in 2014 and granted refugee status by the South American country under then-president Jose Mujica. The Uruguayan government resettled the men into a four-bedroom house, where they have been staying for the past few months since their release. Ex-prisoners complained about their housing conditions. One of the six men, Tunisian Adel bin Muhammad El Ouerghi, said "we are too many to stay in the house” and complained they had to stay in a hotel from time to time, AP reports. But the men were recently evicted from the hotel as they had no funds to pay the bills. 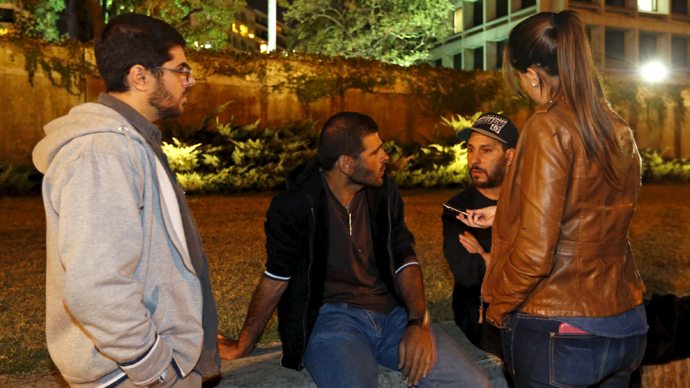 Another former detainee Omar Mahmud Faraj said the Uruguayan government had "promised many things, but so far these are only words.” At the moment each of them receives around $600 (roughly 15,000 pesos) per month to cover food, clothes and other items. Late on Friday the former prisoners came in front of the US Embassy, saying they wanted to speak to the ambassador. The embassy was closed, and calls and email messages to the embassy went unanswered. They said they were ready to spend the entire night there. Their protest was peaceful: at one point in the evening the four men got down on the ground and prayed. Faraj said their actions might help them raise attention to the situation they are in as they have no means to support themselves. The six men were detained back in 2002. They were never charged and spent over a decade in the Guantanamo Bay Military prison. They were cleared for release in 2010, but were unable to go back home and had to stay in prison while the US authorities found a country willing to host the former terror suspects. In 2014 Uruguay’s then-President Jose Mujica agreed to host the men on humanitarian grounds. However the situation has changed since then. Mujica's successor, Tabare Vazquez, has promised his nation will not resettle any more former Guantanamo prisoners, and called on the US to help the six men already there to re-start their lives.